Meet ALEXA. 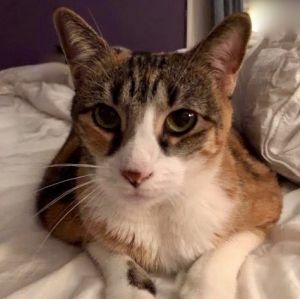 She is a 5 year old female CALICO whose owner died leaving her feline housemates and her homeless. Alexa is a BIG girl who is a bit shy at first until she feels comfortable, but once she’s secure, she is very, very SWEET and KIND. Alexa loves other CATS and is often found SNUGGLING and CUDDLING with them. Come meet Alexa and see for yourself what a GREAT kitty she is. Alexa is in residence in Westchester, NY. She is spayed, UTD on shots, and FIV/FeLV negative.